The RInside package provides C++ classes that make it easier to embed R in C++ code -- on either Linux, OS X or Windows. Embedding R is described first and foremost in the 'Writing R Extensions' manual in the core R sources. It describes how to embed R --- but it does not make for easy reading as there are many little details to take care of. Viewed from another angle, this is one of the standard motivations for abstraction and embedding (of both the logic and the little details) in dedicated (C++) classes. Presto -- that is exactly what RInside does. While this example is contrived, real-world uses are in the (possibly repeated) calling of data preparation, scrubbing, pre- or post-processing in the context of a C++ program. So rather than writing the data you may have out to file, calling R, parsing results back in -- and worse, doing this over and over -- you can start R once, and pass data structures to it, call functions you may have preloaded and get condensed results back. And thanks to the Rcpp package, integration is seamless. A long blog post details use of RInside with the Qt framework. Another long blog post details use of RInside with the Wt library for building web apps. RInside owes its basic structure to littler, the first-ever R scripting front-end by Jeff Horner and Dirk Eddelbuettel. 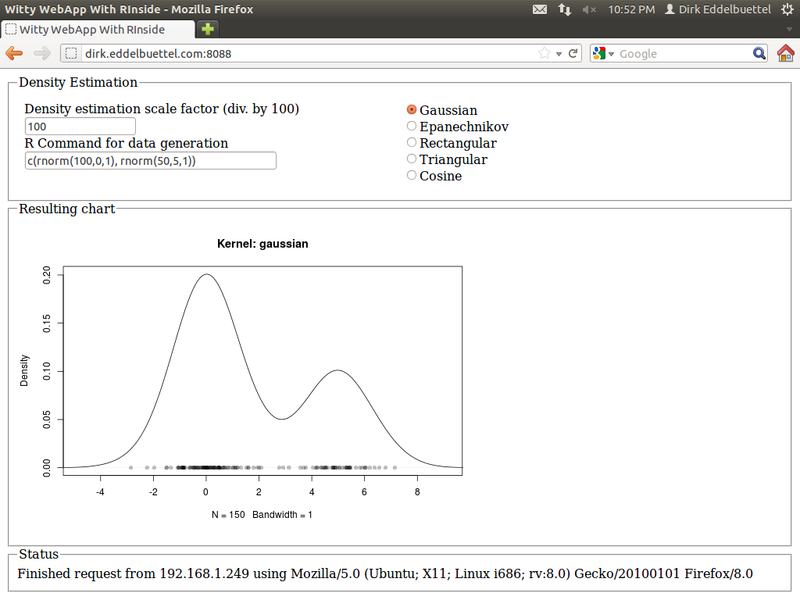 RInside, just like littler, owes a lot to the tricks Jeff learned about embedding R via his Rapache project. However, RInside is a fresh C++ version of these ideas. Version 0.2.5 should build, install and run on just about any Linux and OS X system, and even on Windows machines that have the Rtools compiled by Duncan Murdoch as detailed in the The Windows Toolset appendix to the R Installation manual. Do not report an error if you fail to build this with another compiler as this is not supported. Note that to build the examples on Windows, you need to say make -f Makefile.win to explicitly selects its Makefile. 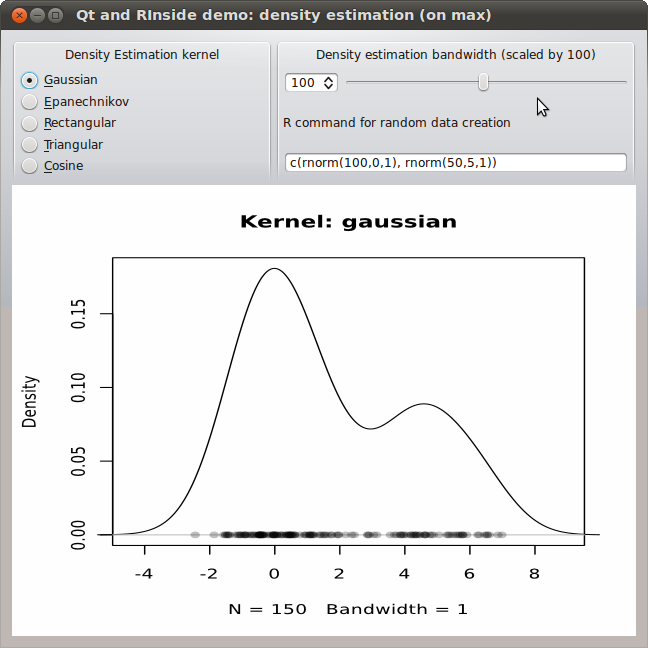 RInside works particularly well with the Rcpp package for interfacing R and C++ and shown by the examples in the RInside distribution. In fact, it now depends on it too. A total of fifteend complete examples are provided in the directory examples/standard, as well as three test programs that triggered earlier bugs. These can serve as simple examples for your own programs. After installation, just say make in the examples directory (and say make -f Makefile.win if on that other OS). Other examples directories show the Qt and Wt examples, use with MPI, use with the Rcpp extension Armadillo and Eigen as well as using Boost for a multithreaded application. All examples are self-contained and fully functional. Just say make in one of the example subdirectories. The examples/ directory provides some working examples. Auto-generated html documentation is available as is the manual generated from the help files. A local archive is available here; it also contains the Doxygen-generated documentation. There is also the CRAN page and git access is provided at the GitHub repo. Questions regarding RInside should go to the rcpp-devel mailing list. This is a subscriber-only list, so you need to subscribe before posting. also be changed via a setter function. by James Bates which restores RInside on Windows -- at long last! we now default to static linking on OS X and Windows as Rcpp does. parseEvalQ from int to void which is more in-line with it purpose. had devices in the first place. * src/RIinside.h: Added simple logTxt() to log if defined and not otherwise.